If I had to characterize the past week in two words, they would be: pepper problems. These peppers gave me all sorts of trouble! I’d made these quick-pickled jalapeños a couple of times already, but these locally grown peppers were way spicier than the others. Just one little nibble of raw sliced pepper made me feel like one of those silly, red-faced cartoon characters with steam shooting out of his ears. Then, when I was rinsing the sliced peppers under running water in an attempt to cool down their spiciness, the pepper fumes made me cough-cough-cough-cough-cough. I had to use my shirt as a nose mask to get through it. So beware pepper asphyxiation. (I know I sound dramatic right now, but I’m serious.) I’m still recommending them because none of my other batches gave me such trouble. The final result, though, is totally irresistible. Fresh, spicy, with a light sweetness thanks to the bell pepper and honey, and a nice, crisp crunch. You’ll see in the photos that I made a control batch with plain distilled white vinegar and no bell peppers, but I so prefer the gourmet version with honey that I’m going to insist that you go with that one. Really, it was only a matter of time after pickling radishes that I turned to peppers. These peppers are fantastic on nachos, tacos, quesadillas and so much more. I’ve always loved pickled jalapeños, but lately I’ve been frustrated by store-bought varieties that are sliced too thick (they overwhelm the other flavors) and taste way too salty (again, overwhelming the other flavors). Not to mention, many pickled jalapeños contain food coloring and preservatives in addition to vinegar, which I’d just as well avoid. If you want to make sure your peppers aren’t crazy spicy, buy big ones so it’s easier to remove the seeds and membranes before slicing. That’s where the heat is concentrated. You might also want to avoid more mature peppers with striations on the sides, which are rumored to indicate hotter peppers. If you taste a little sliver of a few of your jalapeños and none are crazy hot, you probably don’t need to worry about getting crazy hot pickles. All that said, pickling the peppers with vinegar, salt and a little bit of honey tones them down quite a bit! 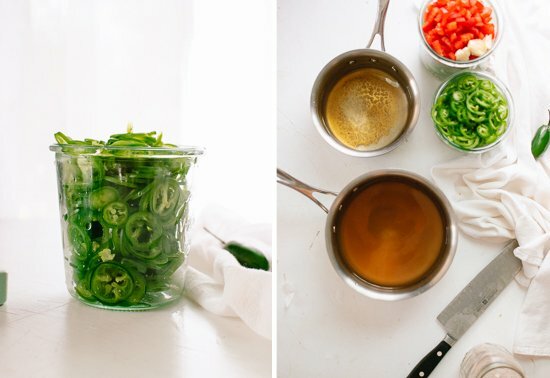 If you come across a bunch of jalapeños at the farmers’ market this weekend, you can bottle them up for later with this simple refrigerator pickles recipe. 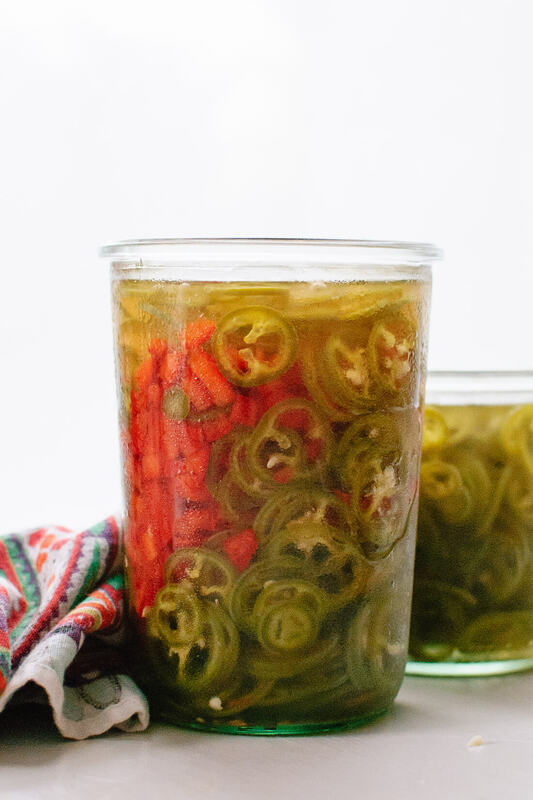 Please let me know how your pickled jalapeños turn out in the comments! I hope you love them. On a pickling kick? 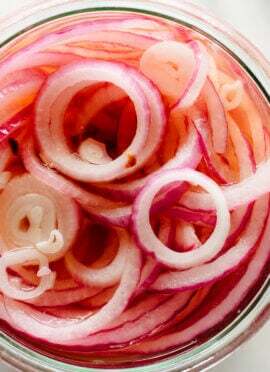 Don’t miss my quick-pickled onions, radishes and veggies! You’re also going to love my fresh jalapeño relish recipe, which is very similar to these peppers but even easier. Learn how to make homemade, spicy and sweet, gourmet jalapeño and bell pepper pickles! It’s super easy and the pickles will keep in the refrigerator for months. First, prepare your peppers: Wear gloves to prevent your fingers from feeling burned. For less spicy pickles, use a paring knife to remove the jalapeño membranes and seeds before slicing (this is a lot of work, so I just pulled out the larger membranes from my sliced pickles). Slice the pickles thin with a mandoline or chef’s knife. If you’re still concerned about the spice level of the pickles, run the sliced jalapeños under running water in a colander to try to knock off any remaining seeds. (Beware, those pepper fumes made me cough.) Slice off the top of the bell pepper and remove the seeds and membranes. Chop the bell pepper. 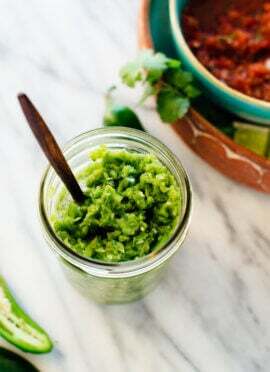 Combine the prepared peppers and smashed garlic in a 28-ounce (1.75 pints) or larger glass jar. In a small saucepan, combine the vinegar, water, honey and salt. Bring the mixture close to a boil on the stove, stirring occasionally to dissolve the sweetener into the liquid. Remove from heat and carefully pour the liquid over the peppers. Use a butter knife to pock down the peppers so they all fit and there aren’t any hidden air pockets. Let the pickles cool to room temperature in the jar, then screw on a lid and refrigerate the pickles. Depending on how thinly you sliced the peppers, they could be ready to eat immediately or might need a couple of days in the refrigerator before they taste fully pickled (just sample one every now and then to find out!). They are best when relatively fresh, but keep well for at least a month. Recipe adapted from my quick-pickled radishes. Make it vegan: Substitute maple syrup, agave nectar or sugar for the honey. I’ve found a grapefruit spoon works great for removing the seeds and membranes…I’d like to try your recipe! Great idea!!! I’m going to put that trick to good use on my next batch. Thanks, Kim! 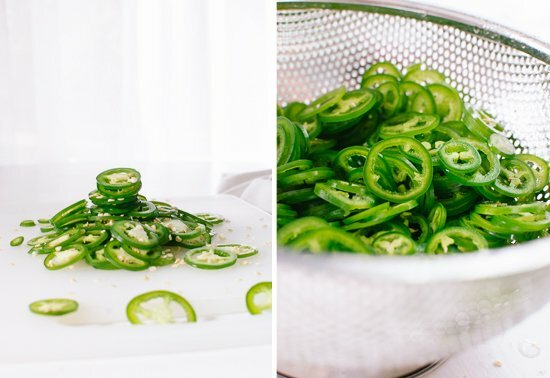 I’m a big fan of pickled jalapenos, and always have a batch going in my fridge. But I’ve never tried using honey in the brine! This may have now pushed me to pickle more hot peppers. The honey in the brine keeps me coming back for more! I’ve never found pickled jalapeños to be quite this irresistible. The honey in this recipe brings pickled peppers to a whole new level of delicious! My family and I are hooked! About to do another batch up right now. The first batch did not last long. Thank you, Sandra! Glad to hear it! It seems so spicy hot to me. But it also looks great! You really missed the perfect opportunity to discuss picking a peck of those peppers. Very disappointing, TBH. I bet the honey adds a nice flavor. They look absolutely delicious! Quick question, though — what do you eat them with? I’m a novice when it comes to pickling things, let alone jalapeños! Hi Bethan, good question, and I’m sorry I didn’t provide suggestions in the post! I forget that not everyone has grown up eating Tex-Mex like I did. I love pickled jalapeños on anything with Mexican flavors, like quesadillas, burritos, tacos, huevos rancheros and nachos. I also love them on pizza (especially with pineapple!). Hope these ideas help! Pickling peppers now makes nachos, tacos, and chili that much better in the winter. Thanks, Michelle! Hope you love these just as much! jalapenos are so sneaky! i can never tell when i’m getting a crazy spicy one or a half-dead-watery one. maybe that’s part of the fun, i guess, but it always just makes me feel like a big wimp when a jalapeno makes me cry. these pickled peppers look awesome and i love your bright photos, kate! 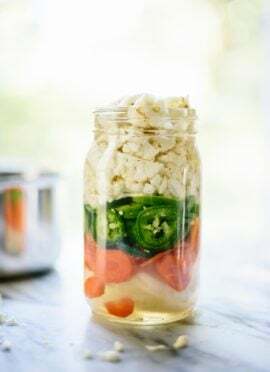 I’ve never pickled anything, but this looks like a great recipe to start with! I bet these are so delicious with the honey and apple cider vinegar. I’d love to try them on tacos! Thanks for sharing, Kate. Oh, I can confirm that they are great on tacos! I hope you’ll give these a try, Julia! I just love picked peppers but have never made my own at home. I might have to start with these! 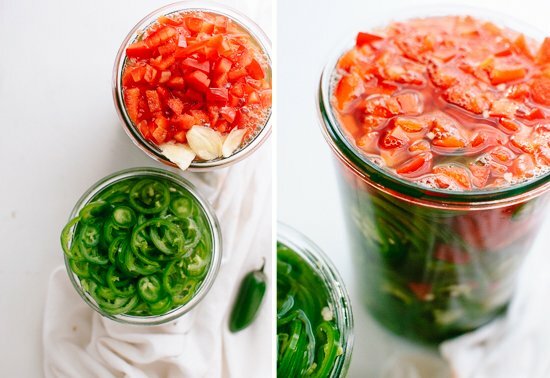 I love the idea of bell peppers and honey alongside the spicy jalapenos- beautiful pictures too! Thanks, Anjanee! I think you would love these peppers! They taste more fresh and flavorful than the store-bought variety, that’s for sure. Growing up in Texas where Tex-Mex is a staple, picked jalapenos are also a staple! Throw them on nachos, tacos, fajitas. They’re served with BBQ a lot, too. You could even toss them in your pho! I WILL be trying this recipe soon! Thanks, Mandy! I never thought to add them to pho! Pickled peppers are the best! I could eat them all day. (Although, to be fair, I usually use slightly less spicy peppers. I don’t think I could eat pickled jalapenos Quite all day.) So good on huge sandwiches! Oh goodness, this is so exciting. 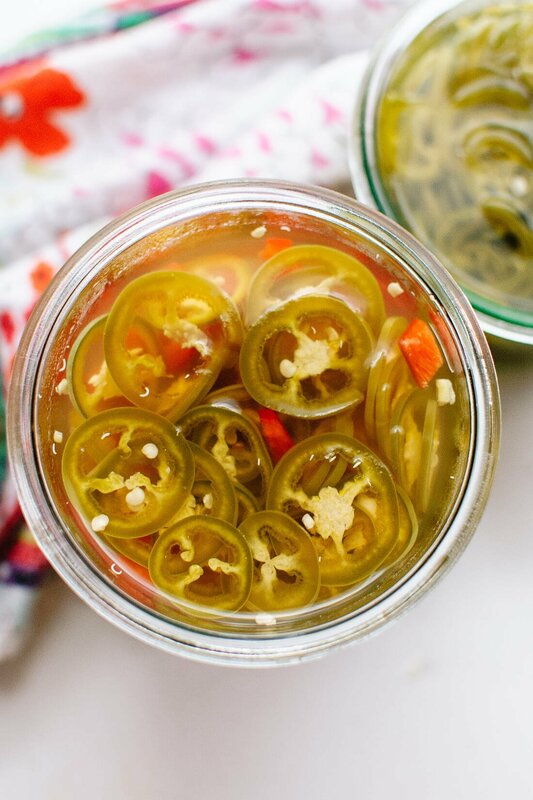 I never really had pickled jalapenos until about a year ago, when visiting my mother who used some in her morning eggs (just eggs, cheese and these, please). In-croy-able! The store-bought kind are a bit on the unnecessarily pricey side, on top of what you already said, but I never even thought to do this. Thank you thank you thank you!! This is great! I actually have two huge ziplocs of hot peppers from my garden, even after making a huge batch of green curry paste! This is what I will do with them, and I know they will be great to have around to add a little zip to things. Pickled peppers are my favorite sandwich/burger/chili/ALLTHETHINGS toppers! I love how you mixed some bell pepps into this mix. Such a good idea – why shouldn’t they get to partake in the pickling fun! Hi there, I just love this site. The recent post about the things in season is awesome. This recipe looks great and I want to try it. I have a lot of peppers and not so much room in my fridge. Was wondering if this recipe could be adapted for canning? any thoughts? I am a bit of a novice but have most of the equipment for water bath processing. As long as you process in a water bath for the correct time for your sea level they should can fine. I make candied jalapeños which as also very good and the shelf life is about 8 months. Hope this helps! Try the pepper rounds in a Momofuku brine. It is sweet also. This is so weird! I did a bunch of pickled peppers and other veggies about 2 months ago — but haven’t posted them yet. Then today, I saw David Leibovitz did pickled jalapeños! Great minds, right! Incidentally, these would be perfect on our fish tacos tonight! PS – I like the idea of adding honey! I look forward to trying this with both hot and sweet peppers! We eat 2 pounds of mini baby bell peppers a week in salads, but I’d like to keep some for when our hurricanes shut down our power for days. If I pickle them I won’t lose them! 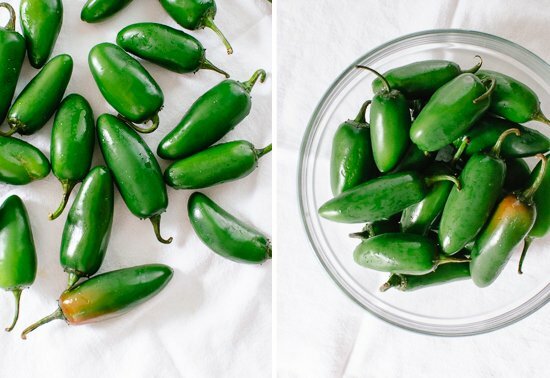 We eat lots of Mexican food every week, and pickled jalapenos would be handy. They make me cough like crazy, too, and once when I got a VERY hot batch they burned my hands, but that has only happened once! Still,in cutting a batch, I will be cautious and wear gloves! Thanks for sharing the recipe! Sounds good! Hope you enjoy these pickles, Barbara! Hi Pete! Do you mean the outer pepper skin or the inner membranes (the white stuff, which is really spicy?). No need to remove the outer skin, but if you don’t want super spicy pickles, you can remove the membranes. Yeah I meant outer skin. Thanks for the reply. My peppers turned out amazing! I used a white wine vinegar mixture and 1 clove of garlic and they are really delicious. I also tried radishes with a cyder vinegar mixture. They didn’t turn out so good. I wouldn’t reccommend that combo. Thanks for getting back to me, Pete! Apple cider definitely imparts an apple flavor, so I can see why you might not like that combo. Just made your Quick Pickled Peppers with Hatch peppers. They arrive in Austin for a short period of time during the summer. Will let you know how they turn out. WOW!! Tried this recipe and it is just so tasty plus not too hot if you remove the seeds and membranes…next batch I am going to leave a few seeds in the jalapenos. Thank You Kate!!! I moved from Phila to Vermont, and miss the Italian hoagies with sweet and hot peppers! No such thing here. I am dying to try this recipe! Can I leave the sweet peppers in strips? Will the sweets become spicy? Could I separate the hot from the sweet? Yes, you can slice the peppers however you’d like! The sweet peppers will become spicier, so you might want to pickle them in separate jars. You can also add more sweetener if you want them even sweeter. Hey Kate, this looks delicious. I have a question, can I use some other peppers rather than halapenos? Yes, definitely! Any peppers you like should turn out nicely, although the heat level will depend on the peppers you choose. How long do you suggest refrigerating them before eating them? I made a batch the other night and they look so pretty sitting in the jar in the fridge– can’t wait to try them! I bet they’re good to go now! No harm in tasting them now, anyway. At the suggestion of dear old Dad, we used Seasoned Rice Wine Vinegar and SHAZAM – no more tartness. Works great for radishes, as well as peppers! Tried this recipe today using El Jefe peppers and sweet bell pepper strips. I also added slices of sweet yellow onion. Can’t wait to try them. How long do they have to sit before eating? Those sound great! You can just taste test them and decide when they’re ready. The amount of time depends on how thinly you sliced the vegetables. How long should these be in the fridge before eating? I have become addicted to peppers prepared this way. I love spicy foods, so I’ve been leaving the seeds in, and I just can’t get enough! I don’t bother with the capsicum, I just layer in red, green and yellow chilies with garlic and pour in the liquid. Thank you so much! Thanks, Debra! Glad to hear it! I am going to try a different twist on this. I have a batch of small red and green jalepenos from the garden.. gonna try and do them dill style.. with dill weed, mustard seed and turmeric. Will still add a touch of honey to help cut the bitter because these are very ripe. Your version sounds so good! Hope they turned out great. Yay, happy to hear it! Thanks, Janet. Oh – my – goodness! This was so good, I could have drank the juice! I had my entire jar eaten, by myself, in three days! It would have been sooner, but I was trying to give my husband a chance. He missed out! His loss, my gain! I plan on making these again for a bbq this weekend! How long will these last in the refrigerator? For best flavor/texture, about two weeks. There’s so much vinegar in the recipe that they won’t go bad for a long time, though. hello, I’m loving this recipe, i have a different type of question. i was given a bunch of different types of peppers from a neighbor’s garden, I only eat them every once in awhile, i don’t want to toss them. My questions are how can I preserve them for a long time, can they be frozen? Would I be able to water bath this recipe for preserving? Sorry, I’m not a canning expert, so I would not recommend trying that. worked great with salsa peppers, put one tablespoon of sugar and half a tablespoon of honey. simple but perfect recipe. I made this recipe using a mix of Italian sweet, mild jalapeño and aji dulce peppers (habaneros without the heat) that I grew. I don’t like hot foods so growing the mild versions of the hot peppers provides us with the flavor of the hot peppers without the heat. The pickles came out fantastic. Thank you Kate. Hi, have you ever tried cold packing the pickled peppers? Just wondering if that would work. Hi Suzette, I haven’t. It might work, but the peppers will need longer in the refrigerator before they’ll taste pickled. Stumbled across your blog while searching for a quick pickle recipe for the insanely hot peppers our garden is churning out. (Hubby chose the pepper plants this year but will not be doing so again–sticking to familiar jalapeños next year which are child’s play compared to these monsters). Just made them this evening and already sampled one and the heat is nicely toned down–delish and so pretty in the jar. Looking forward to following your blog! Katie, thank you for your note! I’m glad you found my blog and enjoyed these peppers. Hope you find some more recipes to try here, too! Super easy but super tasty! Great success on our first try. I used Mexican bell peppers instead of jalapeño. My husband and I both love it! This recipe is amazing! 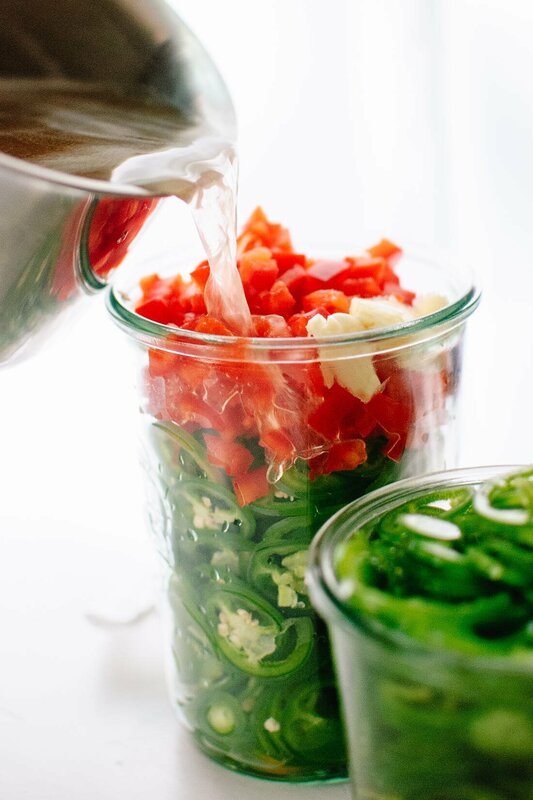 Quicker and easier than water bath canning, plus the crispiness of the peppers are preserved. I made this with several pounds of Cherry Bomb peppers. It has only been a few days but I can already tell these won’t last long. They’re fantastic with sliced tomatoes. Let me know what you think once you give it a try, Christine! Tried it with thinly sliced carrots heated in the brine. These are so good, great recipe thanks. Thank you for this recipe I am going to try it! West Elm says those Weck Jars are no longer available. That stinks! I’m sorry. You can also look for other mason jars at Target, Amazon, etc. Thank you for this recipe. It’s quick, low sodium and flavorful! You’re welcome. Thanks for he review! Can I use this method for mini bell peppers? Since they are not hot, do I need to remove the seeds and membrane? I haven’t tried it, but let me know if you try it! We made these a couple of days ago and finally had the chance to eat them atop breakfast tacos as we sliced them a little bit on the thicker side. We grew Serrano peppers in the back yard so we used those instead of jalapenos and did not have any bell peppers on hand so we omitted those. We were excited to use the local honey we love so much instead of sugar. Our pickled peppers turned out SOOOO VERY DELICIOUS!!!!! They are just the perfect amount of heat with a sweet note tied into it. A delight for the tongue! This is our 2nd time using your recipes and we are hooked! Thank you so much for sharing. Smiles!!! Smiles right back! Thank you, Kristie for sharing your experience. I love that you are hooked! I know this recipe is nearly 4 years old and somehow I’ve never left a review, but I am always circling back to this one. This year was my first year with a garden, so I used it about 5x more than other years! Soo delicious on top of avocado toast, among many other things. I’m so glad you circled back to write a review, Mary! Thanks for your comment, too. I made a half batch. It wasn’t NEARLY enough and was gone in a few days. I cooked the garlic in the brine solution, next time I plan on adding raw garlic and in one jar,, some crushed red pepper.